No smoke without fire, although with the tear gassed Istanbul, Ankara and numerous other cities, one should say: no smoke without tears. While things are unfolding on the streets of Turkey, the international audience of the events are trying to figure out: what is going on. Who are the demonstrators? Hence, kicks in the usual suspects of repertoire of explanations: is this like Occupy Wall St.? Is this the Turkish version of Arab Spring? Are the demonstrators a vocal minority, and we are just misperceiving lots of social media traffic as a major event? Perhaps the question itself should be differently posed. There are lots of great commentaries floating around, longer texts with already now some excellent contexts of the events. Some of it suggests in a rather good way that we need alternatives than just choosing one existing model of explanation. Perhaps what is unfolding in front of the international community is what Turkish people already knew: a corrupted and authoritarian culture of politics and business where having firm relations with the ruling party AKP is a benefit for a variety of jobs and economic success for private sector companies (see here for some context); lack of transparency in political decisions that however affect the majority of the people, such as the building of the third bridge or for instance in this Istanbul case, the demolition of Gezi park. The sentiment of dissatisfaction was there already in a way that was not just about secular vs. Islamists. What is already being voiced is that “This is not about secularists versus Islamists, it’s about pluralism versus authoritarianism,” (quoted in The Economist). Besides internally about Turkey, the events reveal a lot about the logic of capital: it benefits from authoritarian state measures and tight security controls. As for the case of Turkey, things are supposed to be fine on the economic front. But the problem is how much of this growth is exactly focused on the banks as main benefactors and how much of the consumption and investments is done only on credit money. If there is a major economic (read: construction business) bubble growing in Turkey and it bursts, things might very soon be very different – economically and politically. Even a lot of the middle class is actually still, despite university degrees and stable jobs, in a precarious situation. In any case, the question “Occupy or Tahrir” is actually: what is the specific case of Turkey? Besides revealing details of more global trends of how capitalism enjoys authoritarian regimes (see Zizek on this point) it demands the continuous question of what then is happening specifically in Turkey. Discussing with my friends in Istanbul, one thing popped up when they narrate the events of the past days: even they, participating, just don’t know everything. They are not sure how things will develop, but they remain hopeful. There is a sense of momentum and an affect that binds across groups, but also the question “who are we”, referring to the protestors, is an open one. 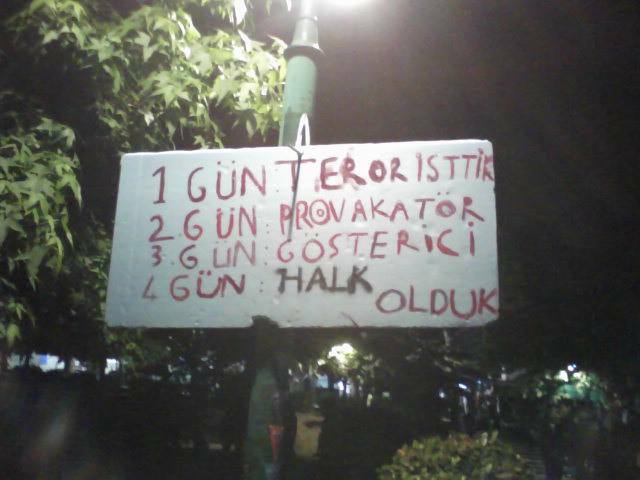 Perhaps it is open for a good reason, summarised in one of the placards from Istanbul. It refers to the various attempts by the prime minister to publicly discredit the demonstrators. But it also gives an affective response, one example of the various texts and visuals that express a strong positive sentiment. We are not sure who we are, but we will be the people. Photograph by Baris Safran (via Jodi Dean). Eine kurze Beschreibung von Medien-Theoretiker Jussi Parikka, dem ich auf Twitter folge. Gut an dem Text finde ich, wie Jussi die Entwicklung der Bewegung in den ersten Tagen beschreibt: An Tag 1 waen wir die Terroristen, an Tag 2 waren wir die Provokateure, an Tag 3 waren wir die Protestierenden, an Tag 4 waren wir das Volk. Breathless Park Life: Occupy Istanbul?